now available on Amazon (USA sales). of countries whose Amazon sites (or Borders) claim to be able to sell the book. as well as some history, and opinion. and the Algebraic Design of Physics"
is now published by Springer (which recently bought Kluwer). This link works as of 2005.05.17.
pdf of "Algebraic Spinor Reduction Yields the Standard Symmetry and Family Structure"
A version of this idea that was presented at a conference in 2013. (First ever paper rejected by hep-th. Well well. I must endeavor to be less flippant in future. 2012 pdf: Division algebras, Clifford algebras, and periodicity. 2010 pdf: Division algebras as spinors; idempotents; symmetries; particles; interactions. 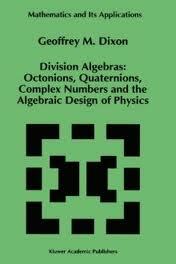 2007 pdf: A short look at the split octonions and associated Lie algebras. 2007 pdf: Why is T complex? 2006 pdf: Advocacy of thinking differently: flame on! 2005 pdf: Mathematics and the Multiverse - Musings. Modified: 2005.08.16. 2004 pdf: Division Algebras: Family Replication - Appeared in J. of Math. Physics, October 2004. C ⊗ H2 ⊗ O3 accounts for the Standard model, leptoquark family structure, AND family replication. Modified: 2004.04.18. 2005 pdf: Integral Octonions and the Octonion XY-Product and more (a work in progress) - Last modified 2009.12.02. Continuing development of multifamily model based on C x H2 x O3, we find an algebraic origin for parity nonconservation. 2002 pdf: Division Algebras: Family Replication - Earlier version of the C ⊗ H2 ⊗ O3 replaced above. 'A Fire in the Night' has been removed to avoid its being any longer misinterpreted. 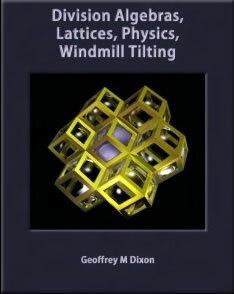 1995 pdf: Lattice Fibrations - Old paper, but one of my favorite pretty ideas. Friend Tony, from quarks to Zen. John Baez, Have Math, Will Surf. Big buncha info: Division Rings. Shahn Majid's Quantum Gravity pages. A History of HyperComplex Numbers. Apologies to all I've missed. Let me know if you'd like to be included.